The ET Risk toolbox report frames the concept of the ET risks project aiming at providing a comprehensive toolbox for financial analysts and institutional investors with scenarios, asset-level databases and financial risk-return models. 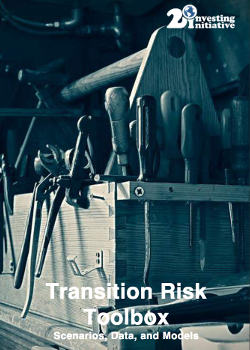 Scenarios: The report highlights the need for an enrichment of existing transition roadmaps to provide the key inputs for risk models, notably around policy costs and incentives, market pricing, production & technology, non-conventional, and other macro factors. Data: The report finds a key role for physical asset-level databases, as well as data around adaptive capacity and financials, in order to inform risk assessment. Reducing the search and transaction costs for these databases is a key part of the work plan for 2017. Models: The report highlights two key challenges related to transition risk modelling - mapping macro effects to micro actors - and the ‘tragedy of the horizons’. The modelling vision laid out in this report will be piloted by Kepler-Cheuvreux, CO-Firm, and S&P.